Nikki Bayley is an award-winning travel writer, guide book author and spirits and cocktail journalist whose work appears in National Geographic Traveller, The Globe and Mail and the Difford’s Guide. 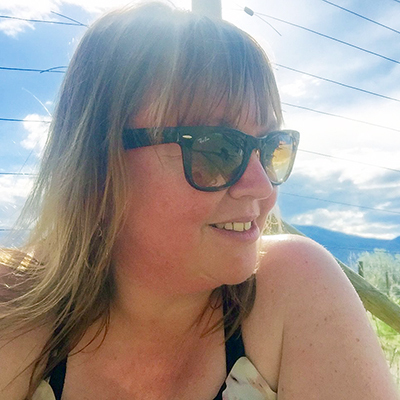 A cheese fan, hula hooper and all-round word nerd, she writes regularly for BCLiving about food, drink, spas and everything else that makes life worth living. Over the past year, Whistler has been quietly reinventing its dining scene. Sure, you’ll still be able to scarf down poutine and pizza, and favourites like Sushi Village (Hiro roll, please! ), Dubh Linn Gate, and, on the higher end, Araxi and the Bearfoot are going nowhere –thank goodness! But there is a raft of newcomers in town, so we made the trip up the Sea to Sky to find out more. Pull out your stretchy pants and join us on a whistlestop dine-around of Whistler’s hot new restaurants. Because it's part of the Toptable family (Araxi, Blue Water, CIn Cin), I was expecting Bar Oso to be something special and I wasn’t disappointed. The room is gorgeous: all statement Spanish titles, a gloriously over-the-top swirly onyx bar and lashings of beautiful light fixtures. 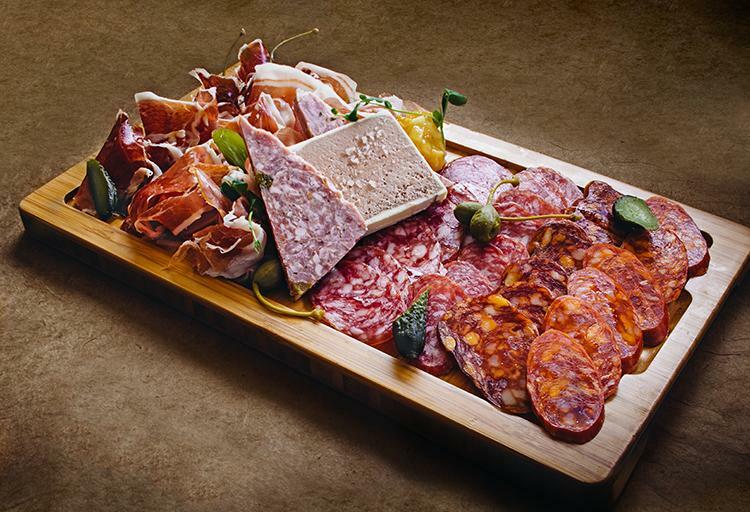 Oso specialises in in-house charcuterie and imported Spanish meat and cheeses, along with shared plates raciones of classic Spanish tapas fare such as albondigas (meatballs) and anchovies. I swooned over a terrific scallop crudo, deliciously buttery with a hint of heat and a citrus-y kiss, and adored the sliced-from-the-leg iberico de bellota which delivered an exquisitely porky-peppery hit and pairs wonderfully with Oso's by-the-glass rioja. The cheese and meat boards offer superb value, make sure you try the Mahon cheese, it’s a delicacy in Minorca, one of the Balearic Islands off the coast of Spain and hard to find in Canada. On the drinks side, try the Spanish-style large pour gin and tonics made with local and UK gins and premium tonics, or plump for their Oso Sour, a perfectly-balanced bacon-infused bourbon cocktail which comes with a tasty strip of candied bacon. Legions of happy visitors have giggled, shivered and shot their way through the Bearfoot’s legendary ice vodka room. 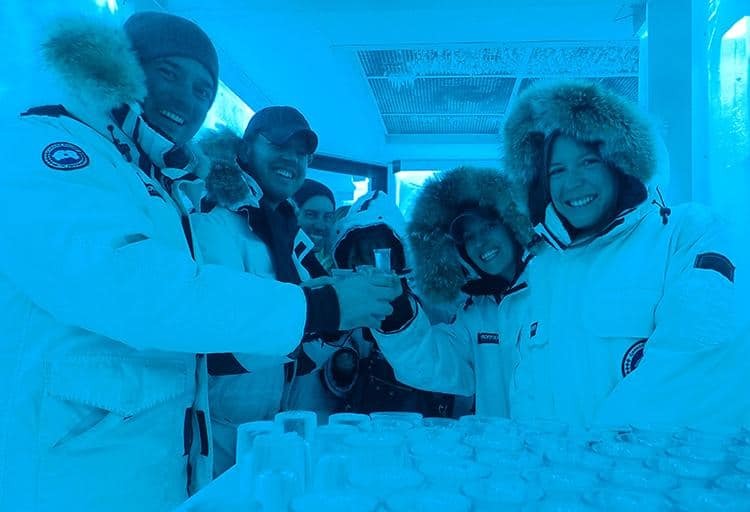 At -32°C (-25°F), the Ketel One Ice Room is the coldest in the world and now it’s expanded so it’s even larger and you can fit 20 guests (and their Canada Goose parkas) into the blue-lit space. On offer, at $48 for four shots of vodka, you can pick from some 50 different varieties from around the world. Check out the local B.C. selection with contenders from Vancouver Island’s Sheringham Distillery, and North Shore’s Deep Cove, as well as Swedish Purity vodka which is distilled 34 times for maximum clarity, or perhaps the diamond dust-filtered French Kealy’s for a fancy shooter. 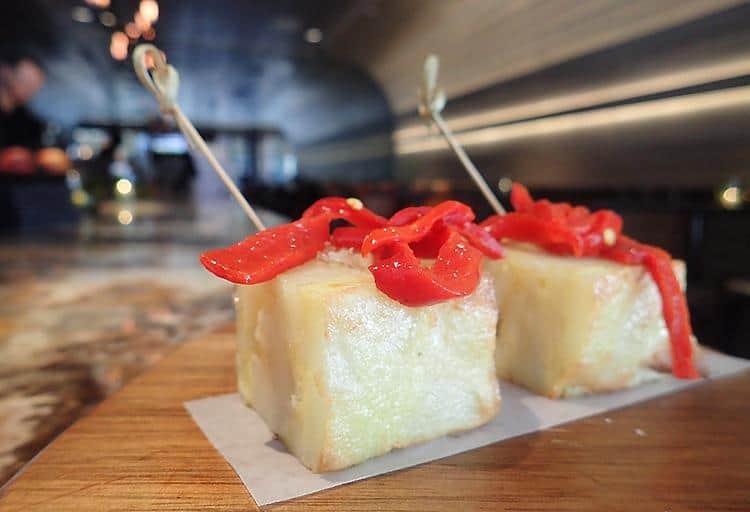 Once you’re back in the warmth, you have to try the Manchego and Spanish ham croquettes from the bar menu: ooey-gooey bites of cheesy-ham-y heaven with a tangy black garlic aioli. Happy hour reigns from 3 to 6 p.m. every day with 50% off the bar menu. 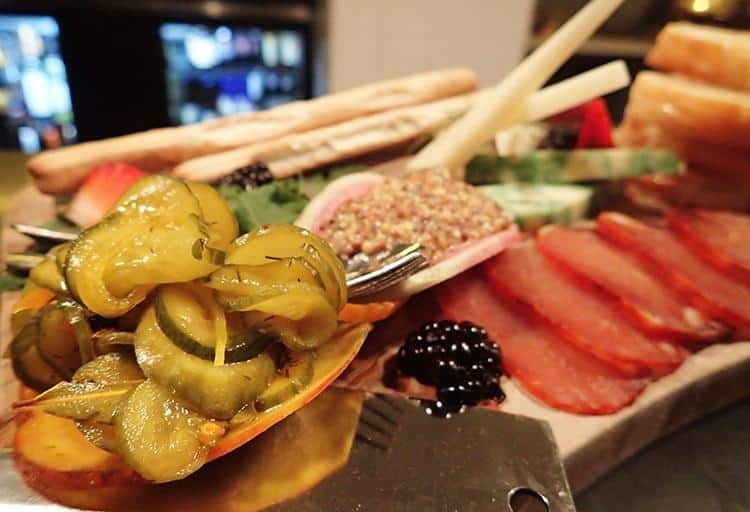 On the main drag where The Mix by Ric’s used to be, Basalt, with its stripped-down minimalist blonde wood room and sizeable patio, offers imported cheese and charcuterie boards along with larger fish and meat mains. I adored their take on a kale salad, crisp with fried chickpeas and spangled with pancetta. But, although the cured meats, salumi and cheeses are of excellent quality, showcasing meaty delights from Italy and Spain, and wonderful cheeses from across Europe, I winced at the price: $10 per cheese and $9.50 for cured meats. A shared platter could be over $50. Ouch. Admittedly they are works of edible art, garnished with their excellent house-made mustard on a ‘dish’ of watermelon radish and liberally adorned with crackers and breads, but perhaps this is best visited with a US-dollar-toting friend? A more affordable option would be heading to Basalt at lunchtime as the menu hovers around the $20 and under mark, and you can scoff panini stuffed with two charcuterie items and one cheese for just $16. 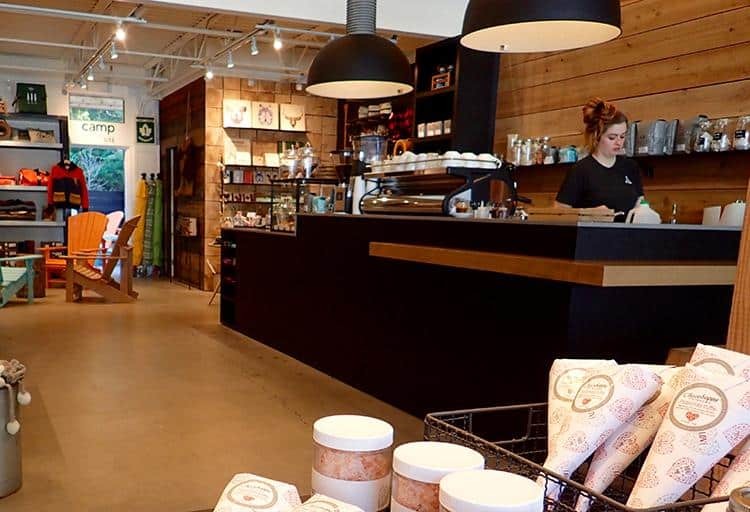 Campstyle is an adorable new coffee and Canadiana camping supply store at Function Junction which spreads across two floors and has a hidden garden out back, where, if you’re lucky, the firepit will be roaring and you can toast marshmallows. The coffee is from Vancouver’s 49th Parallel, so absolutely excellent. There are bags of gluten-free goodies on offer, as well as teas, sodas and gelato. The lifestyle part of the store is an all-Canadian mishmash of wildly desirable knitted toques and jackets, artwork, beautiful handmade blankets, soy candles and cushions from local, sustainable designers and artisans. Stop by on your way to your next camping trips to caffeinate and make your tent the most stylish place on the mountain. On a bluebird day, there’s nothing better than soaring up the Peak2Peak gondola, marvelling at the glaciers, skiers and all-round amazing views. 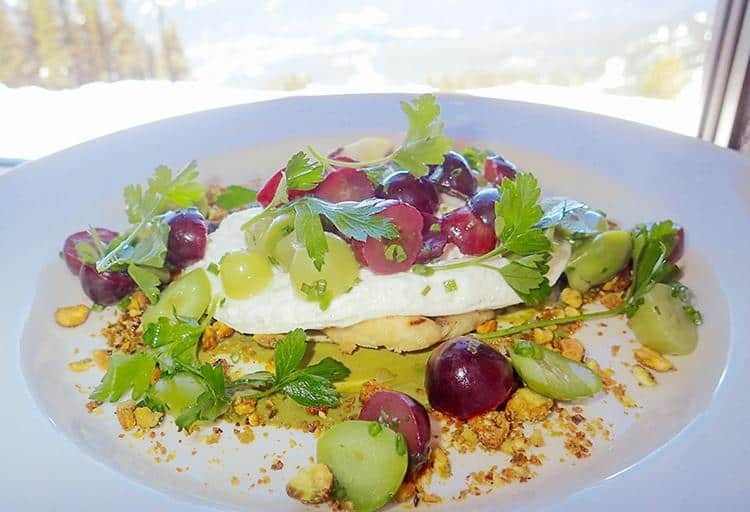 Well, until Christine’s relaunched, because now there’s something even better at the top of Blackcomb mountain: a (very) casual fine-ish dining restaurant with jaw-clanging views and some of the best food in Whistler. Chef Steve Ramey worked at Hawksworth for almost five years and it shows with those bright citrus notes and subtle Asian flavours, but really, who better to be influenced by? I can’t think of when I last ate anything as delicious as the BBQ duck salad, punchy with papaya, hoisin, sesame and citrus, but skillfully balanced and plate-lickingly good. The dungeness crab risotto was pleasingly silky and surprisingly light with plenty of crunch from celery and sea asparagus. Never much of a dessert fan, nonetheless I dove into the excellent banana and salt caramel crostada made with buttery flaky pastry. The service is stellar, the wine list excellent, and the room is a beauty. Whether you ski or not, it’s definitely worth bagging a reservation here and enjoy the mountain views along the way. Could this be the hardest-won reservation in B.C.? 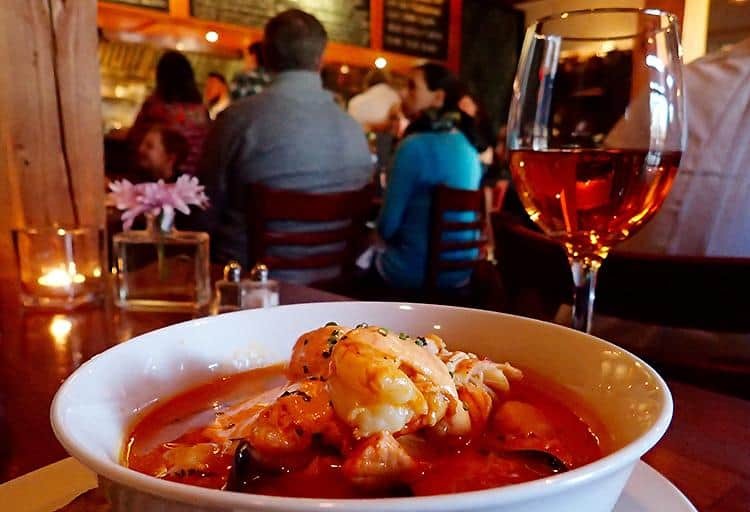 It’s certainly almost impossible to get into chef RD Stewart’s Red Door Bistro without at least a few weeks’ notice. It’s a cosy room: just under 40 seats, the best view is at the bar where you can watch the team prep their ambrosial food, unless it’s summer and you can sprawl on the patio and sigh over the mountains. This is classic French bistro food at its very best using West Coast ingredients: perfectly tender scallops made sweet with poached pears on a bed of creamy celeriac, a superb bouillabaisse which positively swam with chunks of seafood, bobbing with plump prawns and sweet mussels, and rich with a broth that whispered of hours of slow simmering to get such a phenomenal depth of flavour. This may be a tough reservation, but trust me, this spot is absolutely worth planning ahead for. All hail your new favourite breakfast joint, sunny patio hangout zone, and late-night eats bolt hole! There’s pretty much nothing I don’t absolutely adore about Stonesdge, from the ultra-friendly welcome to the free-range eggs and ethically sourced meats on the menu. I stopped by for breakfast and had the benedict special, a bacon-wrapped sausage (made in-house) slathered in smooshed-up avocado, a buttery hollandaise and served with the world’s best crispy-and-fluffy potatoes. Got a busy day planned? 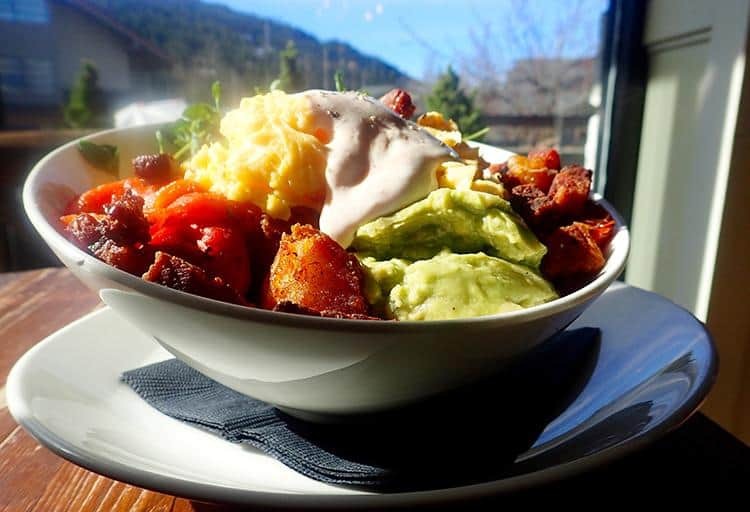 Check out the huge breakfast bowls piled high with enough goodies to keep you going all day long. Open from morning till late, and boasting Whistler’s only proper post-10 p.m. food menu, you’ll find the bar buzzing with after-hours bar and restaurant folks, and co-owner Jimmy’s generous pours are already the subject of Whistler legend.